Start with a risk-free consultation - simply fill out the form below to begin! Your thoughts and ideas become our inspiration. The Kitchen Master is the premier kitchen and bathroom remodeling contractor in Naperville, Illinois. From initial design through completion, your kitchen or bathroom remodeling project will be delivered on time and on budget with an unwavering focus on quality. Our start-to-finish approach means you don’t have to worry about the details, whether it’s a complete kitchen renovation, a bathroom refresh, or a smaller remodeling project. You’ll get the finest results from Naperville’s best kitchen and bath remodeling company. Ready to start your Naperville bathroom remodel or kitchen renovation? The Kitchen Master is the team to call. Our professional designers can make your vision a reality, whether you want to update the look of your cabinets or completely change the layout of your kitchen or bathroom. We can even handle plumbing, lighting, and hardware updates! From traditional to modern and everything in between, our team is ready to make your kitchen and bath design dreams come true. Contact us today for a free consultation! 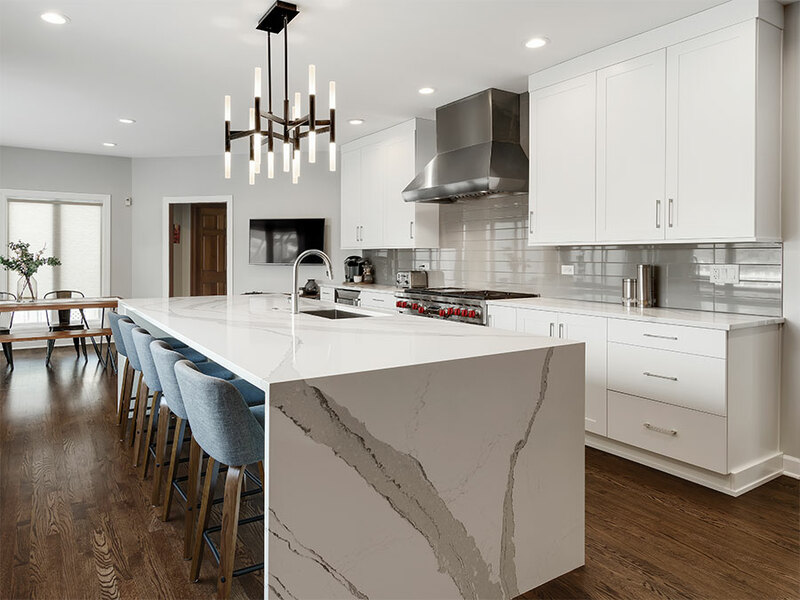 We offer kitchen and bathroom remodeling services in the Naperville, IL area, including: Aurora, Batavia, Downers Grove, Geneva, Glen Ellyn, Hinsdale, Lisle, North Aurora, Oak Brook, Oswego, Saint Charles, Sugar Grove, Wheaton, and more! If you’re unsure whether your home falls within our service area, please don’t hesitate to give us a call. Looking for design ideas? Check out our online gallery or visit our 4,000-square-foot kitchen and bathroom showroom in Naperville. No one walks into our kitchen, dining, or living room area without being flabbergasted! It’s truly a ‘Better Homes’ kitchen and a great deal of credit goes to Kitchen Master. Download your guide today and get closer to the kitchen of your dreams!